One of the authors I spoke with offered me two of her books to read, review and share as I wished. Her name was Lauren Kelley and she has written a series of very cute and useful children’s books, ideal for home-school, classroom, enrichment and enjoyment. I asked my dear friend, Sam, who happens to home-school six littles, to read them and write a review. I also asked her to share the books with her tribe so we could get input from the age group that the books are geared toward. Tuggie and his Mum make a leap of faith onto a boat destined for the “New” America from England. His adventures begin as he befriends a Native pup, Half Moon, upon arriving in RI. In the first book, tensions flare between those loyal to the king and those loyal to the colonies, climaxing with the burning of the HMS Gaspee. My son enjoyed this book so much he described it as “wonderful”, which for him exemplifies his enthusiasm. Typical of many boys his age, I usually have to fish for any adjective beyond “good”. He was a bit distressed when Half Moon lost an eye during the boat raid, although it didn’t go into enough detail to concern me. In the next book I read of the series, “The War of 1812”, with his parents reunited, Tuggie sets off to Washington DC and ends up saving President Madison’s Yorkie from the famous white house fire. My oldest daughter and I struggled a bit with the lack of fluidity (chapters are short with time passing between) and we both agreed that Dolly Madison was somewhat misrepresented. My son liked the action in these books while the very tame love story between the pups in the second was not lost on my daughters. These beautifully illustrated books are sprinkled with historical facts and will appeal to many 7-10 year olds. The “painterly” approach to the illustrations is perfection. 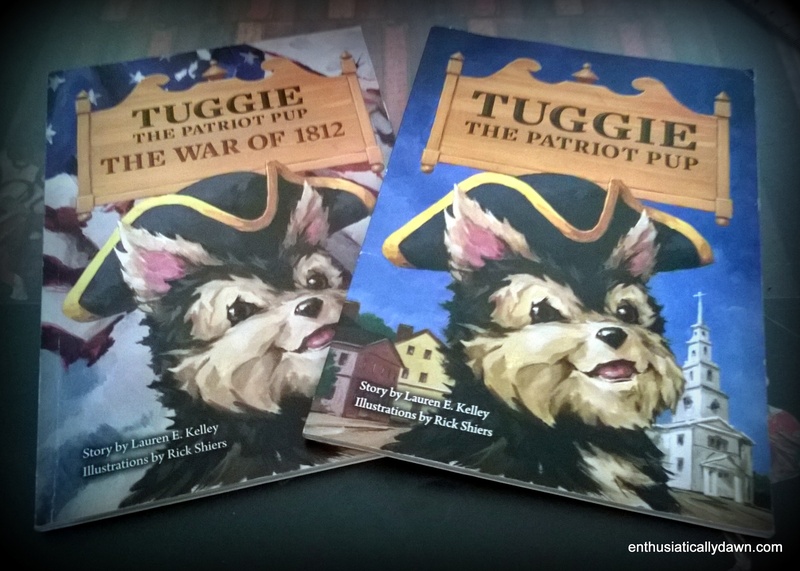 “Tuggie, The Patriot Pup” is well suited as an introduction to the remarkable study of US history. As I like to say (when it suits me), better late than never, so thanks Lauren for putting these beautiful books in my hands and trusting that this blogging chick might eventually follow through, and thanks to Sam, and the littles: Anne, Drew, Elle, Claire, Ruth and William (who I am not sure actually had his toddler hands on the book, but always receives an honorable mention regardless). Be sure and enter for your chance to win these books Below! Contest is closed. Congratulations Barbara London! Previous My Testimony in Poem (#iamapoet) Next Have We Forgotten? The books sound like something my 3 youngest grandchildren would love! They love animals!!! Thanks for sharing! Yay my Father in Law lives in Warwick! :-) The series seems a nice one I would of loved to use for my kids when they were younger. What a neat perspective from a pup how cute! I enjoy chatting with authors and writers too. Tell me more about your writing projects too! 🙂 I’m working on a writing project on ministry and women. It’s hard work, and exciting, and fun, and still in the early stages. It’s fun to cheer each other on as writers.